You make a gift of cash, securities, or other appreciated property into a trust: $100,000 for cash or securities and $250,000 net for real estate. The trust pays a fixed percentage of the value of the trust assets, re-valued annually, to you or to beneficiaries you name. 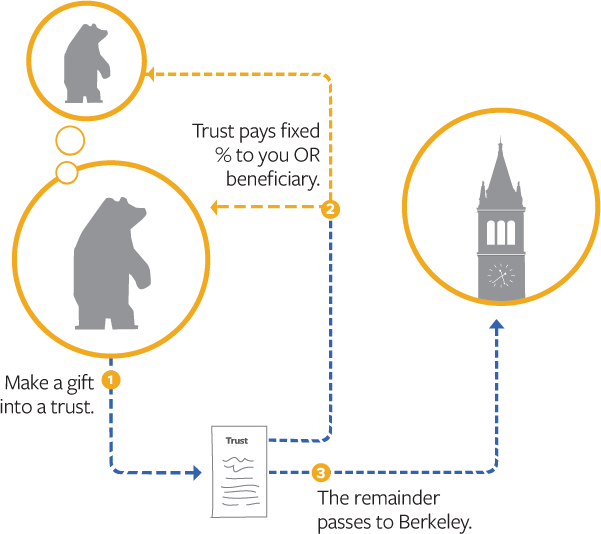 When the trust terminates, the remainder passes to Berkeley to support the campus’s highest priorities or specific programs you designate. Retain an income stream from the gifted assets for you or loved ones. Pay no capital gains tax at the time of gift. The trust can be for the lifetime(s) of the beneficiary or beneficiaries or for a term of years, depending on your circumstances. You have the option of making additional gifts to the trust over time. Highly appreciated assets with no or low yield can be used to create a higher yield and more diversification. For more in-depth information, please call one of our experts at 800-200-0575.